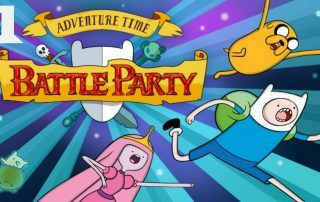 How to download and install Adventure Time: Battle Party? Adventure Time: Battle Party is a free-to-play MOBA. To play, click on the above download link where you will be taken to the author download page. The awesomeness of Adventure Time, on your browser, in a MOBA?! Adventure Time: Battle Party is an online browser-based Unity Web Player Multiplayer Online Battle Arena action game developed and published by Cartoon Network studios for web browsers mainly on Microsoft Windows and other PC ports, and was released on these platforms on June 23, 2014. Battle Party is an action game based on Cartoon Network’s popular cartoon series, and features multiples characters from the show. Battle Party takes place in the Adventure Time world, and hence players are allowed to play as one of the 19 characters available in the roster, each with their own unique skillsets and weapons as well as aesthetics. The characters playable now are: Bill, Finn, Fiona, Jake, Flame Princess and Ice King among others. Players choose one of these characters to form a team of 3 members, all of whom battle against an enemy team of same-numbered characters. Matches can be played either against live opponents or against enemy bots. Battle Party’s story-mode campaign says that Princess Bubblegum wonders why the people of Ooo fight so much, and hence she has called upon various warriors from all over the lands to fight in her Battle Laboratory as an experiment to find out. Unlike most MOBA games of this generation, Adventure Time: Battle Party does not feature a level progression system, so players are always leveled, meaning that nobody can be decimating-ly strong as a result of experience, and the outcome of the game boils down to strategic planning and skills. The goal of each online match is to destroy the enemy’s base within a set time limit, which is a heavy inspiration taken from major games like Dota 2 and League of Legends. Players are accompanied by ally AI “minions”, and they have to destroy turrets along the way, which provide points to the team. In this way, if the timer runs out before a base has been destroyed the team which has accumulated the most number of points is declared the winner. The buying and upgrading of skills is not allowed, and instead, players have to use “backpacks”—pre-made stashes that give stat boosts and bonuses to the characters. Adventure Time: Battle Arena provides it players with three game modes. The first is the Practice mode, in which player will battle 1v1 against an enemy bot character in the Candy Town map. The second mode is the Players vs. Bots mode, in which players form a team of 3 members and face off against a 3-member team formed of AI enemies. And finally, the last mode is called the Players vs. Players mode, and like the name suggests, in this mode players battle it out against real-time players in a 3v3 match. Adventure Time: Battle Arena is a unique game that lasted for 3 full years before it was pulled out of the official in May 28, 2017 due to technical issues.